DO YOU HAVE AN IDEA TO HELP US? We love to count on you and your ideas. There are many ways to help to raise funds for a future without Alzheimer’s disease. If you want to do your bit, you can suggest a sports challenge, make a different kind of gift or organise an original celebration. Register on migranodearena.org and organise your own campaign for a future without Alzheimer’s disease. Get the word out! 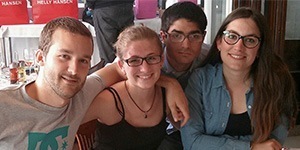 Martí, Maria, Marc and Nina, all of them cousins, held their summer birthday and instead of gifts, asked for donations to be made to Alzheimer's disease research in their name. 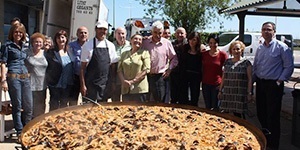 Each year, Josep Maria and Maria Rosa hold a paella celebration in the port with more than 400 people who contribute to our dream of a future without Alzheimer’s disease. 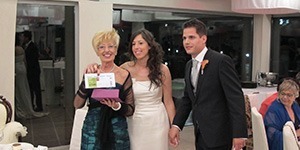 Roser and Dani conceded a space for research into Alzheimer’s disease on such an important day as their wedding day. The Raffel Pagès Craywinckel Hairdressing team collaborated with what they know best, and donated part of their proceeds for a whole month to research into Alzheimer’s disease. Call us on at 902 33 15 33 or send an e-mail message to socios@fpmaragall.org.